Glass Sinks. Get your Glass Sinks here today. 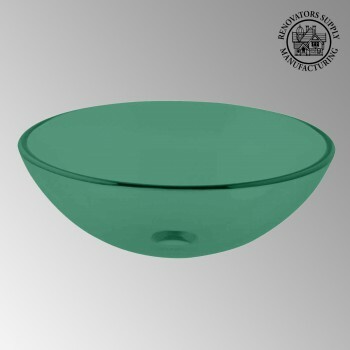 Glass Vessel Sinks: Single Layer Tempered glass sinks are five times stronger than glass, 1/2 inch thick, withstand up to 350 F degrees, can resist moderate to high degrees of impact & are stain–proof. Ready to install this package includes FREE 100% solid brass chrome-plated pop-up drain, FREE machined 100% solid brass chrome-plated mounting ring & silicone gasket. Measures 16 1/2 in. dia. x 6 in. deep x 1/2 in. thick.